Please note, if you are coming south on Rt.3, get off at exit 6B (Ssamoset St./Carver) not Rt. 44 West, because Rt. 44 West has moved. From Route 3 North (Cape Cod): Take exit 6 (Plymouth Center) and turn left onto Samoset Street at the end of the ramp. Go under Route 3 and at the second set of lights turn left onto Pilgrim Hill Rd. Turn right at light onto Federal Furnace Rd. Travel 4.1 Miles. Southers Marsh Lane and SMGC will be on your left. From Route 3 South (Boston): Take exit 6b (Samoset Street/Carver) and merge onto Samoset Street. At the second set of lights turn left onto Pilgrim Hill Rd. Turn right at light onto Federal Furnace Rd. Travel 4.1 Miles. 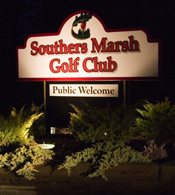 Southers Marsh Lane and SMGC will be on your left. From Route 495: Take exit 2 (Route 58/Carver) and head north on Route 58. Travel 6.9 miles, continuing straight on Tremont Street where Route 58 turns left. Tremont Street becomes Federal Furnace Road at the Carver/Plymouth town line. Southers Marsh Lane and SMGC will be on your right. From Route 58 South (Halifax/Plympton area): Take Route 58 South. After passing through Carver center, you'll pass South Meadow Road towards Plymouth Airport on your left. 1.4 miles after South Meadow Road, take a left onto Mayflower Road. Follow Mayflower Road to the end and take a left on Tremont St. Travel 2.9 miles (Tremont Street becomes Federal Furnace Road at the Carver/Plymouth town line) and SMGC will be on your right.